General Allen Hal Turnage, who earned the Navy Cross and the Distinguished Service Medal while leading the 3d Marine Division on Bougainville and Guam in World War II, died 22 October 1971. General Turnage had retired from active duty on 1 January 1948, and was advanced to four-star rank on retirement by reason of having been specially commended for heroism in combat. General Turnage was born 3 January 1891, in Farmville, North Carolina. He attended the University of North Carolina before entering the Marine Corps as a second lieutenant on 17 November 1913. Following instruction for 17 months at the Marine Officers' School, Norfolk, Virginia, he joined the First Brigade in Haiti in 1915 and participated in expeditions against hostile Cacos in Northern Haiti, then was assigned to duty with the Haitian Constabulary until August 1918. Almost immediately, he was sent to France where he served as Commanding Officer, Machine Gun Battalion, 5th Marine Brigade. Following World War I, he was an instructor at the Marine Officers' School, Quantico; served with the Gendarmerie d'Haiti again from 1922 to 1925; and completed the Field Officers' Course at Quantico. Later, between two tours of duty at Headquarters Marine Corps, he was assigned sea duty on the staff of Battleship Divisions Four and Three. In 1935, General Turnage was appointed Director of the Marine Officers' Basic School at the Philadelphia Navy Yard, following which he served with the 1st Battalion, 5th Marines, as Battalion Commander and Regimental Executive Officer, respectively. Ordered overseas in 1939, he served as Commanding Officer of Marine Forces in North China, and Commanding Officer of the Marine Detachment, American Embassy, Peiping. He returned to Headquarters Marine Corps in April 1941, and was serving as Director of the Division of Plans and Policies when World War II broke out. In June 1942, the general was ordered to Camp Lejeune, North Carolina, to take command of the Base and its Training Center which included organization and training of two Regimental Combat Teams for the 3d Marine Division. That October, he joined the newly-formed 3d Marine Division as Assistant Division Commander, becoming Commanding General on Guadalcanal in September 1943. He then led the Division in the landing at Empress Augusta Bay, Bougainville, 1943, and in the recapture of Guam, 1944. After two years with the 3d Division, in September 1944 General Turnage was assigned to Headquarters Marine Corps as Director of Personnel, and, later, as Assistant Commandant of the Marine Corps. In May 1946, his alma mater, the University of North Carolina, awarded him the honorary degree of Doctor of Laws. His final assignment was as Commanding General, Fleet Marine Force, Pacific. In addition to the Navy Cross and Distinguished Service Medal, his decorations and medals include: the Legion of Merit, Presidential Unit Citation, Guam, 1944; Navy Unit Commendation with two bronze stars, Bougainville, 1943, Guam, 1944; Haitian Campaign Medal, Haiti, 1915; Expeditionary Medal, Haiti, 1915-1917 and 1922-1924; Victory Medal with France Clasp and Maltese Cross, France, 1918; Second Nicaraguan Campaign Medal, Nicaragua 1932; China Service Medal, China, 1939; American Defense Service Medal with Base Clasp, China, 1939-1941; Asiatic-Pacific Campaign Medal with three bronze stars; American Campaign Medal; World War II Victory Medal; Haitian Distinguished Service Medal, Haiti, 1925; Nicaraguan Medal of Distinction with Diploma; Dominican Order of Military Merit, Class Two with White Insignia, Dominican Republic, 1930. General Turnage earned the Navy Cross and Distinguished Service Medal while leading 3rd Marine Division on Bougainville and Guam in World War II, and then retired from active duty on January 1, 1948. He was advanced to four-star rank on his retirement for having been specially commended for heroism in combat. Allen Hal Turnage was born Jan 3, 1891, at Farmville, North Carolina. He attended the University of North Carolina before entering the Marine Corps as a Second Lieutenant on November 17, 1913. After instruction for 17 months at USMC Officers School, Norfolk, Virginia, he joined the First Marine Brigade in Haiti in 1915 and participated in expeditions against hostile Cacos in Northern Haiti, he then was assigned to duty with the Haitian Constabulary until August 1918. Almost immediately, he was sent to France where he served as Commanding Officer, Machine Gun Battalion, Fifth Marine Brigade. Following World War I, he was an instructor at the Marine Corps Officers School, Quantico, and then served with Gendarmerie d'Haiti again from 1922 to 1925, and completed the Field Officers Course at Quantico. Later, between two tours of duty at HQ, US Marine Corps, he was assigned sea duty on staff of Battleship Divisions 4 and 3. In 1935, he was appointed Director of the Marine Corps Officers Basic School at the Philadelphia Navy Yard, following which he served with First Battalion, Fifth Marines, as Battalion Commander and Regimental Executive Officer, respectively. Ordered overseas in 1939, he served as Commanding Officer of the Marine Corps Detachment, US Embassy, Peking. He returned to HQ US Marine Corps in Apr 1941, and was serving as Director of the Division of Plans and Policies when World War II broke out. In June 1942, he was ordered to Camp Lejeune, North Carolina, to take command of the base and its training center which included organization and training of two Regimental Combat Teams for the Third Marine Division. That October he joined the newly-formed Third Marine Division as Assistant Division Commander, becoming Commanding General on Guadalcanal in September 1943. He then led the Division in the landing at Empress Augusta Bay, Bougainville, 1943, and in recapture of Guam, 1944. 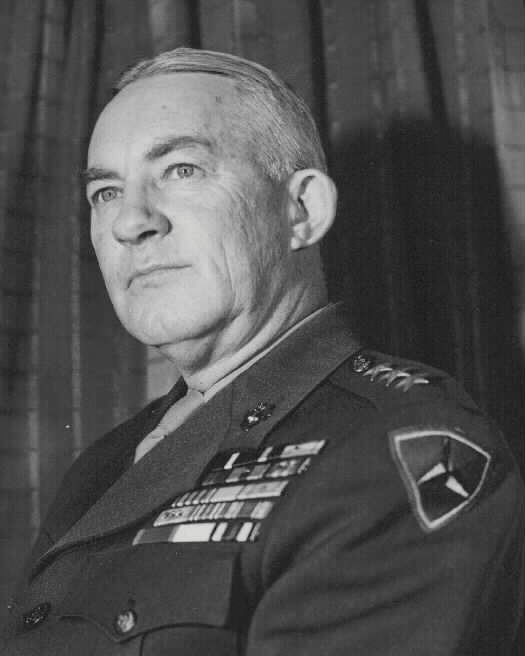 After two years with Third Division, in September 1944, he was assigned to HQ US Marine Corps as Director of Personnel and, later, as Assistant Commandant of the Marine Corps. In May 1946, his alma mater, the University of North Carolina, awarded him the honorary degree of Doctor of Laws. His final assignment was as Commanding General, Fleet Marine Force Pacific. On January 1, 1948, he retired from active service. In addition to the Navy Cross and the Distinguished Service Medal, his medals include the Legion of Merit, the Presidential Unit Citation, Guam, 1944, the Navy Unit Commendation with 2 Bronze Stars, Bougainville, 1943, Guam, 1944, the Haitian Campaign Medal, Haiti, 1915, Expeditionary Medal, Haiti, 1915-17 and 1922-24, Victory Medal with France Clasp and Maltese Cross, France, 1918, Second Nicaraguan Campaign Medal, Nicaragua, 1932, China Service Medal, China, 1939, American Defense Service Medal with Base Clasp, China, 1939-41, Asiatic-Pacific Campaign Medal with 3 Bronze Stars, American Campaign Medal, WWII Victory Medal, Haitian Distinguished Service Medal, Haiti, 1925, Nicaraguan Medal of Distinction with Diploma, Dominican Order of Military Merit, Class Two with White Insignia, Dominican Republic, 1930. 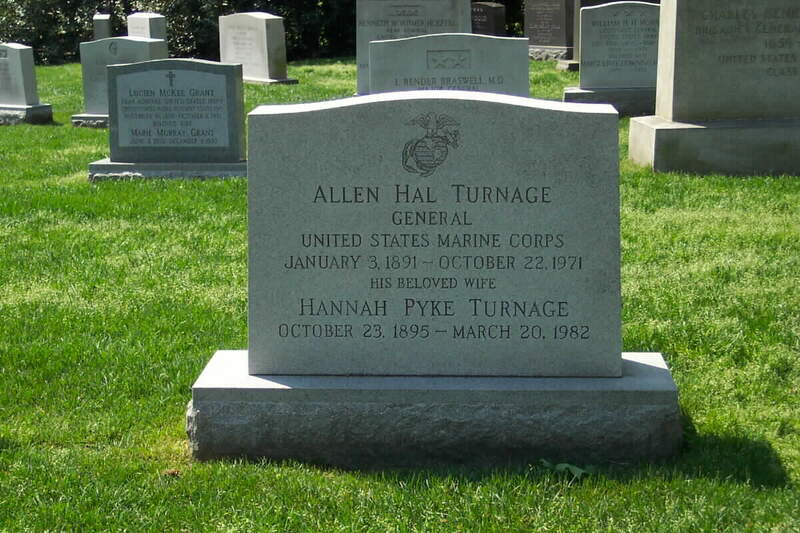 General Turnage died at Bethesda Naval Hospital on October 22, 1971. He was buried with full military honors in Section 5 of Arlington National Cemetery. His Wife, Hannah Pyke Torrey Turnage (October 23, 1895-March 20, 1982), who he married on July 21, 1920, is buried with him.